The frogger is a propulsive exercise that requires the athlete to explode from the start position by engaging the quadriceps, hamstrings, and glutes. As mentioned in the introduction to these exercises, a runner who has weak glutes - or a problem with glute "firing" patterns - requires other muscles to assume the glutes’ responsibilities. Plantar fasciitis can be such a painful condition that it often prevents any running at all. This sheet of fibrous tissue runs between the metatarsal heads and its insertion in the calcaneus (next to the Achilles tendon). 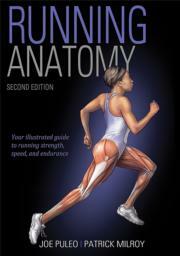 Running Anatomy, Second Edition, features 48 of the most effective exercises for runners—each with clear step-by-step descriptions—and 155 anatomical illustrations highlighting the runner’s muscles in action.